Platforms are validated as partners develop solutions. Control4 invited a number of their key partners to display and show their solutions at CES. The solutions enhance and extend the lighting, climate, audio/visual, and security benefits. From Somfy‘s solutions to manage window coverings and lighting, to iPort‘s solution that leverages the iPod for digital content, to Key Digital‘s HD video and audio offerings for night-club owners, there are a number of solutions to benefit those seeking to create the everyday easy home. Other partners include: Vision Art (custom framed art to cover HD TVs); Card-Access (wireless controls); Home Automation, Inc. (audio, lighting, theater), Eaton (wireless controls); Wellspring Wireless (metering products based on ZigBee); DSC (security), Johnson Controls (light commercial market); and Ember (ZigBee Provider). Hello, my name is Dave Froerer with VisionArt. VisionArt is a system that we manufacture to conceal plasma TVs and flat panel, any flat panel TV that’s mounted either inside the wall like this one is, or can also be mounted – surface mounted on the outside of the wall. We have about 300 pieces of art and about 40 frames. You can also do custom art; you can also do custom frames. So, these are clay prints and it is rolling up and down, so the whole frame doesn’t move. So, you have a beautiful piece of art and instead of watching the TV — and then when you want to watch TV, you hit the â€˜TV On’ on your Control4 remote of course and the art rolls up into the top of the frame. We make every single one of them one at a time for every plasma TV and flat panel on the market. So you tell us what TV you have, and we make it for that exact TV dimensions. We also have a cooling system – if you put it inside the wall so that you don’t have to worry about burning up the TV or the LCD. We have about 300 pieces of art; so we have books like this that are available or everything is on our website, it is visionartgalleries.com. There’s also a link on the Control4 site on the vendor partner area back to our website. So you can view all the frames on our site and all the art. You can also click the frame and it will go around the art for you. You can go to another section of our website and you can play with the wall color after you’ve pictured art and your frames. Hi my name is Kip Meacham. I’m the Vice President of marketing for Card Access. We are an ecosystems partner with Control4 and have actually produced some of the first products designed specifically for the Control4 Home Automation Platform. For example, this device introduced in November is our in home wireless contact switch. It allows you to interface multiple contacts including an integrated magnetic contact and two external contacts of the installers choosing into a single wireless device. It will also measure temperature internally and externally and when powered by DC power, will act as a ZigBee repeater in the ZigBee mesh. We’re announcing at this show, a wireless contact relay allowing us, as you’ll note on this little functional fountain, our ability to turn that fountain on and off wirelessly, again using the Control4 Home Automation Platform. What Card Access has done, is building a variety of wireless products, our expertise being in developing high performance Wi-Fi and other wireless technology radios; and we are integrating that wisdom into the products that we’re delivering to the marketplace. Hi, how you doing? My name is Gina Lutkus from Somfy Systems. Somfy systems is a manufacturer of tubular motors for window treatments. As you can see here we have teamed up with Control4 and we have a device called RTS 2 R232 and how that works is, whether we are using a battery operated shade, a low voltage or hard wired motor, we are able to tie it into a Control4 system. You can see on the Control4 system, this is the main screen, we type in — we have it on the blind shade, we want to bring the blinds up, we touch the upper end, the blinds go up and the light goes off. That’s one scenario that you can have in your house. You can also bring the shades down as well; the shade comes down, the light goes on. It’s another option or scenario that you could have in your house. Like I said before, if somebody offers a battery operated low voltage and hard wired systems, our radio brand name is called RTS which stands for Radio Technology Somfy. So the device that we would use to connect to the Control4 system is XN2 or R232 to RTS device to be able to control that making you control upto 16 different channels, whether you want individual window treatments or group of window treatments. Hi, my name is Kim Anthony Parker. 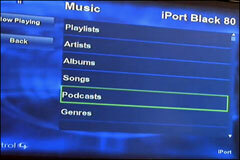 I’m the Director of Product Development for iPort and today we’re showing integration of iPod to the Control4 system; and the thing that we love about Control4 is their ability to distribute this content that’s on your iPod throughout your entire house; and the thing about iPort is, we’ve allowed iPod to now make that information available to you over RS232. So, with that being said, now you can, with Control4, take your system remote control or your mini touch screen or your TV GUI or your 10-inch touch panel or all those products that Control4 offers now, and we go to music – we select music, we then select iPort as our source and we’ve set it up. So now you can see – you can browse the music just like you would on the iPod. So we want to go, select an Artist, we select Artist and then we select an artist and then we go and play the song or the album and hit select and now we’re playing the song that we’ve selected. So, now this would be something that would be distributed through the entire house or played just in a local room. The nice thing about it is it also plays your Apple protected iTunes downloaded songs so that you are not having to worry about if a customer says, “Ay, how come my iTune songs aren’t playing?” This does all that because it actually doesn’t analogue audio output. So, simplicity, easy to program, it’s a module that’s already built with your composer software. You just drag that module over into the home – your project file and then make your connections; your RS-232 connection and your audio connection and you’re off and rolling. Brad, thank you for the opportunity to present my product line to you. A brief history of the company before we talk about the line and how it works with Control4. Our company is founded by Mike Tsinberg, with 39 HDTV patents. He is the number one patent holder in the industry and he is the founder of HDTV broadcast technology and DVD encoding technology. Our product line is composed of switchers, distribution amps, Matrix Switchers, video processors as well as video transcoders. One of our most exciting products is the HDMI2x4 Distribution Amp and Switcher, which basically gives you the flexibility of having both audio and video control – meaning, in the marketplace today, a lot of custom installers have problems with video resolutions not sinking up in HDMI as well as audio not sinking up because of the nature of the HDMI handshake. If there is ever a miscommunication that takes place, or the video resolutions aren’t set up properly or the audio resolutions aren’t set up properly, what you have is a miscommunication and an improper HDMI system; Key Digital addresses that – as well as Control4 being a tremendous partner to us, we have all the drivers available and we work with Control4 to have seamless integration with our products in their control system, and we thank them for the opportunity for being at the show with them. We are HAI – Home Automation Incorporated, my name is Thomas Pickral, I am Manager of Business Development and what we’re showing here today is integration between HAI’s family of whole house automation systems and Control4’s Home Theatre Controller. What HAI specializes in is Lighting Control, Temperature Control, security in whole house audio, and what we are doing is, integrating that into control4’s Home Theater Control so you’ve got the ability to manipulate these things through your television or through a Control4 touch screen. So, HAI products like â€˜security systems’ or â€˜thermostats’ can be controlled through the interface on your television using the Control4 remote. So if you wanted to — while you’re watching TV, control the temperature on the thermostat, would have the ability to come in here for instance, you can down the temperature down to 72 degrees and it will update our current thermostat. You can do the same with â€˜Security’ for instance. So if we wanted to go head and arm our security systems, we’d have the ability to do that – again, just right through the television. Now in addition to the interface provided by the Home Theatre Controller from Control4, HAI is also providing the ability to access these things through the telephone or through the web. So you’ve got the ability to log on and control all these devices – the telephone, by simply picking up the phone inside the house or from outside of the house by calling in or through the internet. So, we’ve got a product called Snap-Link which is this whole USB key and what Snap-Link does is, stores all the information for your house and you could plug it into any PC in the world and log on and control all these different devices. We’re also showing it here on this Samsung Ultra Mobile PC just as a demonstration, this is an off-the-shelf item we bought from BestBuy and it’ll allow you to again, come in here and control different devices like thermostats, adjust settings in here if we want to, or lighting control, and it will even let you view IP cameras. Dave Richards, with Eaton Home Heartbeat Products and we are here in the Control4 booth, showing off our brand new product called Home Heartbeat. The product is very unique in that it is a home awareness type product using this ZigBee technology. We use a simple base station like what you see here, the base station reports to a home key, and then we have any number of various sensors like a water shut off sensor, a front door back door open and close sensor. We have range extenders, power sensors, all types of sensors that can be placed throughout the home and it is truly wireless. So there’s no new wires, and the great thing about the product is that all of these sensors report back to this base station and will give the home owner an alert of the status of that device. So, if a front door is open and it’s not supposed to be, an alarm goes back to this base station, reports to the key fob, where that alarm shows up on the key fob – and not only on the key fob but it also calls your cell phone or gives you an email report of the alarm. What’s also great about this is that — I’m kind of getting lost, but anyway let’s keep going. What’s nice about this is that because we do use the Zigbee technology, we’re allowed to communicate to the Control4 products like what we’re showing here. A simple open and close of a front door can now be reported back through the Control4 system where you can have a light turn on, you can also control ramp rate of how that light comes on based upon the open and close. The same thing can be utilized with a water sensor, if the water sensor detects water, it also can report back to the Control4 system, where then we can choose to turn the water actually off by utilizing our Home Heartbeat automatic shut-off valve or we can choose to do other types of functions through the Control4 system such as bring lights on or give you a blink because there is an alert going on. So the system reports utilizing alerts; you can receive an alert both through the home key while you are at home; it will vibrate or light up and give you an alert through the home key. You can also get alerts through your cell phone, and you can also get an alert through email, and we also introduced a brand new product here at CES, which is our Web portal. So, now you gain full control over the system, so I can see what’s happened in the past week, what’s happened in the past day, and also the alerts report back to the Web portal. I’m Wade Smith, I’m the CEO of WellSpring Wireless, and we make a broad line of sub-metering products that use ZigBee radios, and Control4 is kind enough to bring us in to talk about how we interoperate with their system, and we have here two example products, one is the utility meter – water meter in this case that’s tied to an automatic meter reading system with a two-way radio – ZigBee radio, and shut-off valve that’s battery operated so that the valve can change position in order to sense leaks and to curtail water use if the water bill isn’t paid or if there’s water found down the floor that prevent a catastrophic flood, also to sense small leaks that might lead to mould growth. So, we have another product here which is used in sub-metering of apartments and multi-family condominiums, co-ops, that sort of thing; simply – functionally the same as the utility product but with a smaller meter – 8 gallons per minute, same 2-way radio, in this case a (Inaudible) separate battery; and both of these products essentially function identically, but work at different ends of the marketplace. You can get more information on our Website which is wellspringwireless.com. So, I want to add my special thanks to the folks at Control4 who were kind enough to invite us into their booth to have us be one of the many companies that demonstrates how ZigBee makes our systems able to communicate with each other and operate together. Hi, my name is Abbas (ph) and here I am representing DSC. DSC is a leading Intrusion security provider that actually designs, manufactures and provides and sells Intrusion security control panels; and what we’re doing here, we are demonstrating the integration between a Control4 system and a DSC power series platform. DSC realizes — recognizes that this is where the market is going to go; it’s going to go into the point where everything is integrated. We are going to have a single point of control, where you control all the different components in the house from your — from the comfort of the home owner’s sofa. So what you see here, you have the DSC system with the new product that we’ve introduced, which is called IT-100. The IT-100, it’s a bridging module between the DSC control panel and the Control4; it’s a serial interface that enables Control4 to basically perform and control the DSC control panels. And some other functionalities — this is a demo screen of what the interface GUI looks like, and basically all you have you to do is, by moving your bunch – you’re armed with code — and by pressing on the remote control itself, you can enter the code, and that code will basically arm the system; and you could do it — just as easily, you can disarm the system by going to “Disarm with Code”, and you can enter the code in here. By entering there okay, you basically disarm the system. So, this system — this demonstration demonstrates the easy integration between the Control4 and the DSC Intrusion Security System via the IT-100. Hi, I’m Terry Hoffmann and I’m Director of Building Automation Systems, Marketing for Johnson Controls. We are very glad to be here at the Control4 partner pavilion today, and we are demonstrating to people how Johnson Controls takes the Control4 technology and expands it to be used by people in the light commercial marketplace. The Control4 system, as we deliver it, is called Touch4 and it has some attributes that are slightly different than the residential systems that we all know. This slide summarizes those; it gives us low cost automation for residential and commercial systems, but focused eyes (ph) on the commercial; control and scheduling of lighting, audio, comfort, access, shades and blinds, monitoring, alarming of temperature, humidity, occupancy, and interface with the security system – all of those things that you might find in a normal Control4 system. We have added a BACnet interface through this system, so that we can do commercial temperature control, and in general some of the features like password, and scheduling and especially the alarming have significantly been enhanced for that real commercial building network that people are looking to expand the control system into. So, thanks a lot for stopping by. Hi, my name is Nick Finamore, I’m with Ember Corporation. We are a proud member of the partner pavilion today here at Contol4’s booth at CES. Quite excited to be here; we’re the only chip vendor, we provide chips and software that actually to Control4’s devices as well as the many of the other members of the partner pavilion that you see here today. We provide chip and software technology that allow these devices to talk to one another, and for Control4’s system to be able to control and use, sense and monitoring information from those devices. What’s really exciting about what Control4 is doing is, they’re integrating multiple systems; people are providing lighting systems, providing security systems, media control and other devices and our chips can go into all of those devices, so that they can be managed and controlled with Control4’s system. What you’ll be seeing in the future is more devices, more manufacturers, who’re going be building devices with our chips and software in them that will allow them to be integrated with Control4’s system. So we are quite excited to be here with Control4, who have got many other customers that are building devices that will be integrated with Control4’s systems in the future. So, you can count a long list of manufacturers down the road that will be on our technology and using Control4’s systems.